Charmingly old-fashioned, traditional hotel, pretty basic (small shower room, rather too much furniture for the size of the bedroom. 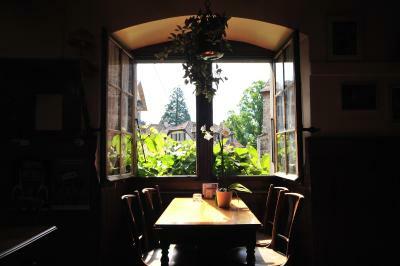 But cosy, lovely view across to the medieval church and Lac Leman in the distance. Right next to bus stop, so easily reachable by public transport. Something a bit different from the usual modern hotel. Lovely garden restaurant - which has a good reputation (I did not have the chance to try it). Francine and all her team were most helpful and friendly, despite the language difficulties. The hotel had a charming little bar and restaurant attached and the bus stop was in front of the building. The staff were nice. Kind staff. Good view of the hills. Nice decoration and furniture. I found a bible in the drawer of the night stand. Kettle, that is so IMPORTANT. Good Service and great breakfasts ( pay extra) , room was nice and clean and bathroom modern. Transport into and out of Montreux is easy, cheap and regular. Don't forget to ask the hotel for your cheap travel pass. 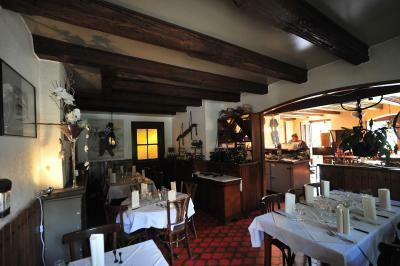 The food in the restaurant is superb, and the staff were very patient as we couldn't speak much French. Its location is right at the heart of the village and is very quaint. We stayed here as it was a good place to stay for the Montreux Jazz Festival. This hotel is conveniently located near the bus station that allows you to get to Montreux. The price per night is a pro as well. The individual who checked us in was very helpful and professional. Located very close to Nestlé Head Office and to Charlie Chaplin Museum and park. Very limited parking at the property, but further up the street there are quite a lot of public parking spots where you don't have to pay for the night stand. 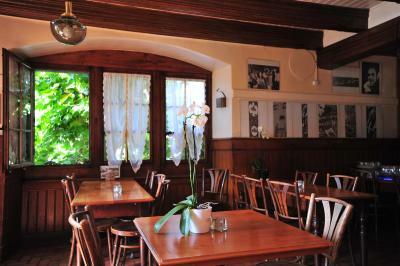 Nice staff, nice restaurant and hotel is an old authentic building. the staff were very helpful - i don't speak french and i'm vegetarian, so i had a tough time finding something off the menu, but they kindly played dumb charades and took care of my food for me! sparrows come and skid-land on the tables as you eat, which is very charming :) the indian gentleman was also very kind and provided an extended bus pass. the cafe/hotel is located opposite a gorgeous, tiny church and near a lovely huge park. the bus service seemed better in this part of vevey than corseaux where i stayed previously. the location is very good if you want to go to avenue reller: no more than a 15 minute walk if you take the stairs shortcut that some other reviewer has mentioned. there is also a bus that goes directly to the station from here. Hotel de la Place This rating is a reflection of how the property compares to the industry standard when it comes to price, facilities and services available. It's based on a self-evaluation by the property. Use this rating to help choose your stay! 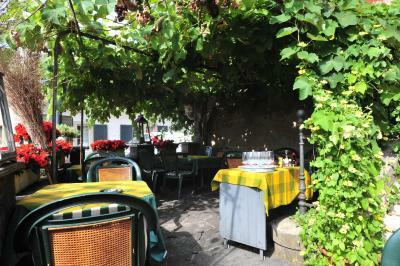 Only a 10-minute walk from Vevey Train Station, Hotel de la Place is located in the small village of Corsier. L'Eglise Bus Stop is right in front and provides connections to the centers of Vevey and Montreux. Chaplin's World by Grevin is just 2 bus stops away. Free WiFi is available. 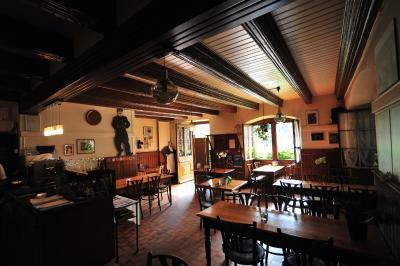 Dating back to 1592, the traditional restaurant features an open fireplace and serves specialties from the Vaud region. 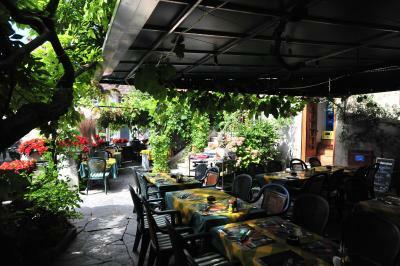 Guests can also dine on the terrace. Lake Geneva is a 20-minute walk away. The medieval Chateau de Chillon is a 15-minute drive away. When would you like to stay at Hotel de la Place? Room with attached bathroom with free Wi-Fi. House Rules Hotel de la Place takes special requests – add in the next step! Hotel de la Place accepts these cards and reserves the right to temporarily hold an amount prior to arrival. Please note that the reception is open from 16:00 on Saturdays. Entry codes for a Sunday check-in can be obtained either by contacting the hotel prior to arrival or by calling the phone at the hotel door on arrival. Room should have less furniture, it felt a bit crowded. Cosy, homely type of hotel. The property was across the road from a church with bells that continually rang on the hour and sometimes on the half hour. I got very little sleep. The bed was a bit hard and my room was at the front of building which is where a smoking area was so I could not leave my window open and therefore, the room was stuffy. The bell church across the street rings at midnight. the cleaning of rooms leaves something to be desired. i found the hair of the previous occupant when i checked in. the beds weren't dusted properly each day. toiletries were sparse even by swiss standards: no shower cap?! the kettle provided for coffee was crusted on the inside and hence usable. the walls are paper thin so you have to really be careful of how much noise you make. the room also was a little stuffy - the tiny pedestal fan is barely enough. the most difficult thing for a traveller is, i think, that the cafe is closed on the weekend. there is nothing else very close by. if you are reaching on sat/sun, please make sure you pick up something to eat near the station itself before proceeding to the hotel! Room was more basic than we expected for the price , including no aircn or desk . The bells from the adjacent Church start at 6 am which is bit of a pain but makes sure you don't sleep in . Don't veer off the recommended walking routesas there is high rise housing down the hill and it does not feel like a safe place to be walking in after dark. The 4:00 pm check in is very inconvenient particularly since check is done in the cafe. We waited about 20+ minutes after 4pm for the doors to open. Only one individual on staff to help with check in etc. No other folks available to assist you on Sundays. The rooms need an upgrade, did not feel clean and were a little out-dated.